Early in the 20th century, Ludwig von Mises warned against the consequences of granting the government control over the money supply. Such a regime inevitably creates money through bank credit that is not backed by real savings — a type of money that Mises termed "fiduciary media." Mises knew that breakdowns of economic activity were the inevitable outcome of government interference in the monetary sphere. However, public opinion has not correctly diagnosed the root cause, regularly blaming instead the free market system — rather than the government — for the malaise. In times of crisis, people call for more government intervention in all sorts of markets, thereby setting into motion a spiral of intervention which, over time, erodes the liberal economic and social order. It is therefore a rather discomforting truth that today's governments the world over produce fiduciary media, the very kind of money Mises had warned us against. It is an inflationary regime. The relentless rise in the money stock necessarily reduces the purchasing power of money to below the level that would prevail had the money supply not been increased. Early receivers of the new money benefit at the expense of those receiving it later. What is more, the creation of fiduciary media artificially suppresses market interest rates and thereby distorts the intertemporal allocation of scarce resources. It leads to malinvestment, which must eventually erupt in collapsing output and employment. The world-wide financial and economic debacle bears testimony to Mises's analysis of the harmful economic and political forces set into motion by a government-sponsored, fiduciary-media regime. 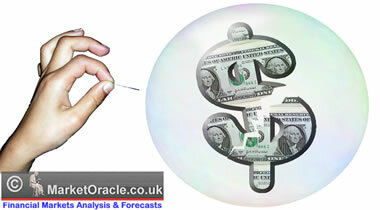 Unprofitable banks will be restored back to health for the purpose of churning out even more new credit and money. This is widely seen as a necessary step to reverse the recession — in actuality the very process that corrects malinvestment — into a recovery. Indeed, in order to prevent inflation-induced boom from collapsing, it is never enough to keep credit and money stocks at current levels. Ever-greater doses of credit and money are needed. The production structure, which has been formed by the relentless increase in credit and money at ever-lower interest rates, begins to unravel as soon as the injection of additional credit and money comes to an end. Murray N. Rothbard described the disastrous effect set into motion by ever-greater levels of credit and money succinctly: "Like the repeated doping of a horse, the boom is kept on its way and ahead of its inevitable comeuppance, by repeated doses of the stimulant of bank credit." It is only when bank credit expansion must finally stop … either because the banks are getting shaky or because the public is getting restive at the continuing inflation, that retribution finally catches up with the boom. As soon as credit expansion stops, the piper must be paid. In view of the strong rise in the monetary base, it might be surprising that some market observers keep expressing fears over deflation — that is, a decline in the money stock accompanied by its usual symptom: falling prices across the board. If banks start reining in loans extended to private households, firms, and government entities, the economy's credit and money stock will contract — and money would quickly be in short supply. 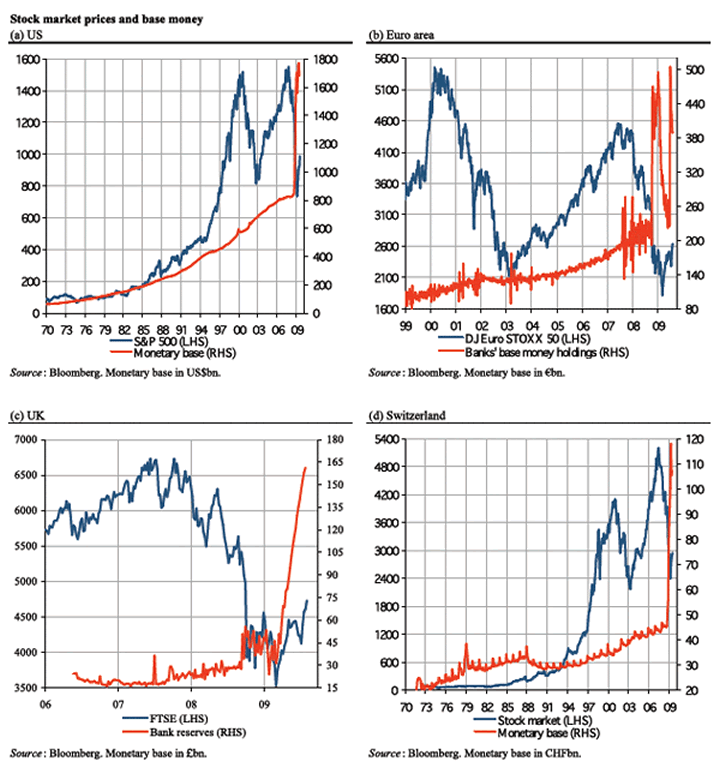 A decline in the money stock would not only force down consumer, producer, and asset prices; it would also entail bankruptcies of firms, private borrowers, and banks on a grand scale, as the latter would no longer succeed in rolling over their ever-higher debt levels. In the United States and the Euro area, for instance, the banking sector is about to deleverage and de-risk its balance sheet. 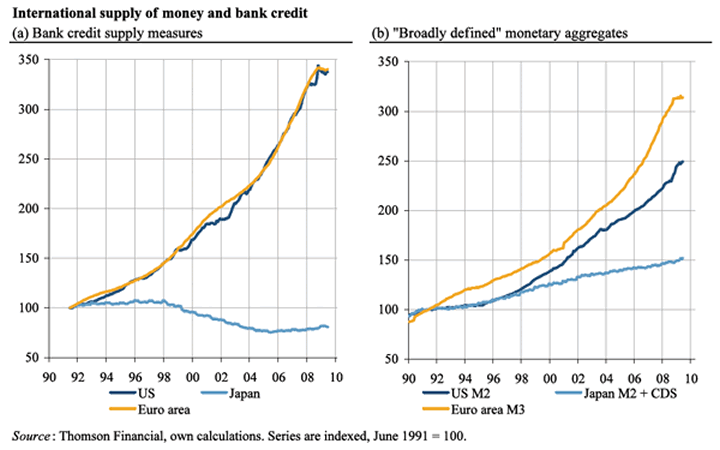 If the banks shrink their balance sheets, the credit and money supply in the economy will decline. Is something unfolding that bears a similarity to what happened in Japan, beginning at the end of the 1990s and continuing to around 2005, when the banks' loan supply contracted? It is this very question that deserves close attention from those who want to get an idea of what may lie ahead for the West. Under a regime of government-controlled money, it is a political decision whether or not the money stock changes — that is, whether there will be ongoing inflation (a rise in the money stock) or deflation (a decline in the money stock). Governments have a marked preference for increasing the money stock. It is a tool of government aggrandizement. Inflation allows the state to finance its own income, public deficits, and elections, encouraging a growing number of people to coalesce with state power. A government holding a monopoly over the money supply has, de facto, unlimited power to change the money stock in any direction and at any time that is deemed politically desirable. 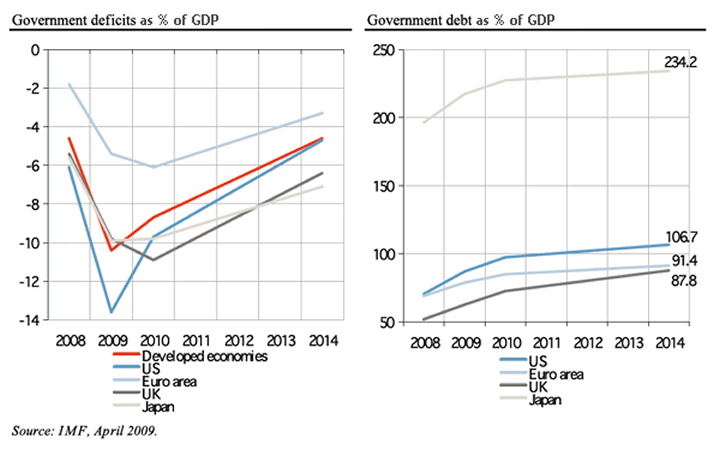 First, the government can increase its deficit and oblige banks to monetize government debt. By increasing spending (for example, on unemployment benefits, infrastructure, etc. ), the newly created money stock enters the pockets of the people. Second, the central bank can start buying assets from banks and other firms (e.g., stocks, housing, etc. ), thereby distributing new money through direct purchases. Third, the government can nationalize banks, obliging them to keep extending credit to the private and public sector on "favorable terms." And fourth, the central bank can create Friedman helicopter money, and "somehow [distribute] it to the public as a transfer payment." The government can prevent the economy's money supply from contracting if a no-deflation policy is supported by public opinion. Mises was well aware of the ideologically and politically rooted inflation bias when he wrote: "The favor of the masses and of the writers and politicians eager for applause goes to inflation." One can expect the inflation bias to be especially pronounced in times of emergency. Faced with falling production and rising unemployment — the unavoidable result of fiduciary media, of inflation itself — people may all too easily consider further inflation to be the lesser evil. Hence, inflation breeds even more inflation. hold that although inflation may be a great evil, yet it is not the greatest evil, and that the State might under certain circumstances find itself in a position where it would do well to oppose greater evils with the lesser evil of inflation. No emergency can justify a return to inflation. Inflation can provide neither the weapons a nation needs to defend its independence nor the capital goods required for any project. It does not cure unsatisfactory conditions. It merely helps the rulers whose policies brought about the catastrophe to exculpate themselves. With regard to these endeavors we must emphasize three points. First: Inflationary or expansionist policy must result in overconsumption on the one hand and in mal-investment on the other. It thus squanders capital and impairs the future state of want-satisfaction. Second: The inflationary process does not remove the necessity of adjusting production and reallocating resources. It merely postpones it and thereby makes it more troublesome. Third: Inflation cannot be employed as a permanent policy because it must, when continued, finally result in a breakdown of the monetary system. Thorsten Polleit is Honorary Professor at the Frankfurt School of Finance & Management. Send him mail. See Thorsten Polleit's article archives. Comment on the blog. Ludwig von Mises, The Theory of Money and Credit (Yale University Press, 1953), p. 409. Murray N. Rothbard, For a New Liberty: The Libertarian Manifesto (Auburn: Ludwig von Mises Institute, 2006), p. 237. Karen Johnson, David Small, Ralph Tryon, "Monetary Policy and Price Stability," Board of Governors of the Federal Reserve System, International Finance Discussion Papers, No. 641 (July, 1999). Ludwig von Mises, Human Action, 4th ed. (San Francisco: Fox & Wilkes, 1996), p. 432. Ludwig von Mises, The Theory of Money and Credit (Yale University Press, 1953), p. 221. In the title of a famous essay written in 1906, Werner Sombart asked, Why Is There No Socialism in the United States? Whether one agrees with his analysis, his premise cannot be disputed: socialism has never enjoyed much of a following in America, except of course among intellectuals. In his vigorous and excellent defense of capitalism, Thomas DiLorenzo dispatches this group of what C.D. Broad called the "clever silly" with entirely appropriate concision. His principal target lies elsewhere. Most opponents of capitalism profess to be its defenders. The market is fine, these opponents say, so long as the firm hand of government guides it. DiLorenzo is concerned to combat one particular variety of this malign species. 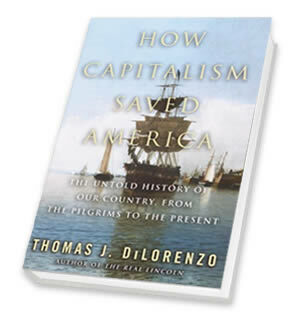 Unfortunately, nationalist mercantilism did not die with Lincoln, and DiLorenzo shows its influence on Franklin Roosevelt, whose economic policies manifested more than a slight tinge of fascism. The opponents of capitalism, both socialists and mercantilists, ignore the fact that laissez-faire capitalism is the indispensable means to prosperity. DiLorenzo's response is simple and effective. The attempt to enforce equality violates human nature. The "disparities in income and standard of living in any economy reflect human nature itself … no two people are the same in terms of ambition, aptitude, intelligence, skill, and so much more" (p. 31). The natural tendency to inequality, which DiLorenzo (following Michels) terms the Iron Law of Oligarchy, by no means disappears in socialist societies. Quite the contrary, it is exacerbated, and in the countries of the Soviet bloc an elite class prospered while the masses lived in poverty. This is of course a mild understatement. Stalin and Mao rank among the worst of the world's tyrants, a fact that DiLorenzo reminds us did not prevent Western intellectuals of great repute from fawning praise of them. A critic of capitalism such as John Rawls might respond to our author in this way: True enough, the pursuit of equality can be carried too far, and the imperatives of human nature must always be kept in mind. But must any attempt to tame the inequalities of the market fail? Why not an egalitarian policy that respects the power of incentives? How can we ignore the philosophical arguments that mandate equality, to the greatest extent possible? DiLorenzo does not directly address these philosophical arguments. They are not his topic, and in any case they lack merit. Rather, his response would, I think, reiterate his central theme. Capitalism is an immensely productive system: if left to itself, it will generate prosperity and provide goods and services that the masses demand. The superiority of capitalism to any alternative system admits of no rational doubt. DiLorenzo appeals in this connection to evidence from various economic freedom indexes, such as the one published by the Fraser Institute in Canada. "These indexes show a strong correlation between the degree of economic freedom in a country and economic growth" (p. 24). The connection between prosperity and capitalism is of course no recent phenomenon. From the days when the attempts at communal production in the Jamestown and Plymouth settlements led to famine and death, episodes to which DiLorenzo devotes a chapter, a simple thesis has proved true. The market works, and interference with it does not. In relying on the manifest facts of history, DiLorenzo has not abandoned his Austrian credentials by discarding theory for a mere recital of facts and "empirical correlations," in the style of econometrics. Quite the contrary, he explains quickly and skillfully a basic point of Austrian theory. Capitalism is, in Mises's phrase, a system of "mass production for the masses." Consumer demand determines what it will be profitable to produce, and alert entrepreneurs gain at the expense of those less able to fulfill consumers' requirements. The historical success of capitalism is no accident. Rather, follows at once from a readily graspable but incontrovertible argument. However, this does not stop various groups from their efforts to tinker with the market. In their foolish attempts to "improve" the only workable economic system, they inevitably make matters worse. The struggle between one such group of "improvers" and their antagonists forms a dominant theme of pre – Civil War American history. Alexander Hamilton inaugurated a program, unfortunately highly influential, in which a powerful federal government in pursuit of its own ends distorted the choices of the market. He "favored the mercantilist policies of protectionist tariffs, taxpayer subsidies for private road- and canal-building corporations, and a government-run monetary system that could finance such patronage" (p. 73). Hamilton faced vigorous opposition from Thomas Jefferson and his many followers, who recognized the fallacies of Hamiltonian mercantilism. As DiLorenzo points out, the Jeffersonians hammered home the connection between a strong national government and mercantilism. Probably the foremost of such Jeffersonians was John Taylor; he believed that "states' rights were an indispensable tool for opposing mercantilist policies" (p. 75). The Hamiltonians wanted a governmentally guided economy; the Jeffersonians did not. Who was right? The answer comes as no surprise. The policy of internal improvements, promoted by Henry Clay and other proponents of his American System, failed disastrously. But is not the free market inherently unable to provide such public goods as highways? DiLorenzo expertly turns aside the elaborate models of welfare economists who argue for "market failure." In numerous cases, roads and canals were built privately. The arguments for market failure resemble the supposed proof offered by Simon Newcomb, shortly before the Wright brothers' flight, that travel by air was impossible. The manifest mistakes of the American System did not deter Abraham Lincoln from vigorous promotion of high tariffs and even more "improvements." DiLorenzo sees this as the key to Lincoln's career. Far from being a champion of human freedom, Lincoln aimed to subordinate the states to his program of economic nationalism. Franklin Roosevelt proved an able student of Lincoln and the Hamiltonians, and in his case, economic nationalism bore disturbingly close parallels with fascism. DiLorenzo notes that Roosevelt's National Recovery Act "was essentially modeled after the Italian fascist system" (p. 191). Like Mussolini, Roosevelt sought to establish boards to set prices in each of the major industries. Once more, a leading politician proved unable or unwilling to accept the truth that free-market capitalism works. Defenders of Roosevelt will counter DiLorenzo by claiming that the Great Depression forced Roosevelt's hand. How can one argue that the free market should operate unhindered when it led to disaster in 1929 and the ensuing years? DiLorenzo easily turns aside this pernicious myth. Following Murray Rothbard's definitive America's Great Depression, he notes that Herbert Hoover's intervention in the market prevented a natural adjustment to the collapse of the artificial credit boom of the 1920s. Hoover's efforts to keep wages high insured continued mass unemployment, and Roosevelt continued his predecessor's misguided policy. After the Supreme Court, in one of its last bouts of sanity, declared the NRA unconstitutional, the floundering president put forward one foolish scheme after another, but none was able to rescue the economy from state-created chaos. The efforts under the NRA to cartelize the economy were ironic, in view of the fact that a principal complaint against the free market since the 1890s was that it led to control of the economy by giant monopolies, whose pricing policies harmed consumers. Only small businesses, reformers alleged, could save consumers from exploitation by John D. Rockefeller of Standard Oil and other "malefactors of great wealth" like him. DiLorenzo in earlier publications has devoted much attention to antitrust regulation, and his discussion of the issue is one of the book's best features. As one might expect from a champion of unfettered free enterprise, he contends that "monopolies," so long as they arise on the free market, serve consumers. But he has a surprise in store. Hand, in a fashion all-too-frequent among those who seek to correct the market, condemned a business for its virtues. Anyone who reads How Capitalism Saved America will have a good grasp of the rudiments of American economic history. I hope that it circulates widely among college students. Those of them who master its lessons will be inoculated against all manner of ideological nonsense purveyed by their leftist professors. David Gordon covers new books in economics, politics, philosophy, and law for The Mises Review, the quarterly review of literature in the social sciences, published since 1995 by the Mises Institute. He is author of The Essential Rothbard, available in the Mises Store. Send him mail. See his article archives. Comment on the blog. Originally published in the Mises Review, Fall 2004, Volume 10, Number 3.